St. James was one of the founding members of the Smithtown Emergency Food Pantry, which opened in 1984. The Pantry operates Monday through Friday from 9.00am to 12.00 noon, and is staffed entirely by volunteers from seven churches in Smithtown Township; church members also donate most of the food. The need for its services has grown every year. In 2011 the pantry provided food for 1,479 families (5,185 individuals). Habitat for Humanity International is a nonprofit, ecumenical Christian housing ministry that seeks to eliminate poverty housing and homelessness from the world, and to make decent shelter a matter of conscience and action. For over ten years we have been a Covenant Congregation supporting Habitat for Humanity of Suffolk, providing construction volunteers and financial resources to build houses with and for people who otherwise could not afford to own a home. 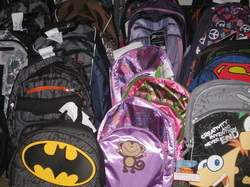 We also collect school supplies for back-to-school backpacks for families in Habitat homes. Every Good Friday, after our afternoon service, St James hosts a blood drive. This has been a tradition for over twenty-five years, helping the Long Island Blood Bank to replenish area blood supplies. Members of the parish and the community at large participate, giving sixty to eighty pints of blood every year. Just down the road in Stony Brook is one of the campuses of the State University of New York, SUNY Stony Brook. As part of our commitment to our community, we are a founding member of and long-term financial contributor to the Protestant Campus Ministry, a ministry supported by Episcopal, Methodist, Presbyterian, and Reformed Churches in our area and providing a part time chaplain to reach out to students, faculty and staff and support them in their faith. Each Christmas, we provide needy families (selected by the Episcopal Ministries of the Diocese of Long Island) with gifts of toys and clothing. Every December, a Christmas tree is set up with the names of housebound parishioners and residents of UCP (United Cerebral Palsy) group homes. Parishioners select a star and buy and wrap a gift for the person; the gifts are delivered, accompanied by the singing of Christmas Carols, by members of our parish (aka Santa and the Elves). Since 1898, during the Spanish American War, volunteers of the Seamen’s Church Institute have knitted, collected, packed, and distributed gifts to mariners who are miles away from home during the holidays. The gift consists of a handknit garment, a personal letter, and information on SCI’s services for mariners. In addition to this, SCI also includes several useful items like hand lotion, lip balm, and toothbrushes—things difficult to come by when working long stretches on the water. While gift distribution happens during winter months, collection and creation of items happens year round, and while many gifts go to international mariners working "at sea," thousands of gifts also go to mariners working on inland waterways here in the United States. Here at St James, we have been making and donating scarves and hats, along with hard candy, for the last 5 or so years. Members of our parish join with those from other local churches to knit and crochet shawls, to be given to people undergoing medical procedures, as a comfort after a loss, in times of stress, during bereavement, or during an illness and recovery. The shawl maker begins with prayers and blessings for the recipient. The intentions are continued throughout the creation of the shawl. Upon completion, a final blessing is offered before the shawl is sent on its way. Some recipients have continued the kindness by making a shawl and passing it onto someone else in need. Thus, the blessing ripples from person-to-person, with both the giver and receiver feeling the unconditional embrace of a sheltering, mothering God! We at St James are frequently involved in providing for local needs as they arise. Recently, we have collected business attire for homeless men in Manhattan so that they have something to wear when they apply for jobs, and clothing for children in foster care, who often arrive with nothing. The Webster Room, located in our Christian Education Building, is regularly used by outside organizations as another form of Outreach to the local community. Groups currently using the room include a Recovery Group and a knitter's group. Also, a number of parishioners participate in a CSA program (Community Supported Agriculture), supporting local agriculture and sustainable farming practices.